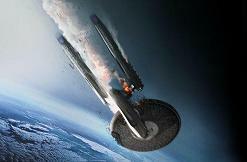 With Star Trek Into Darkness, director J.J. Abrams goes boldly once again and delivers a highly entertaining sequel to his terrific 2009 reboot. Although the film is a bit too insistent on frenetic action at the expense of exploring strange new worlds, the cast, headed by Chris Pine as Captain Kirk and Zachary Quinto as Spock, are uniformly excellent. 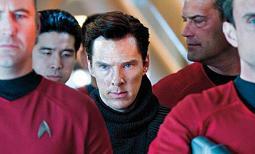 And it's given a healthy sense of antagonism by fantastic British actor Benedict Cumberbatch – who really enlivens the drama as villain John Harrison. Naturally, Michael Giacchino returned to score Into Darkness – his energetic, epic score for the 2009 film was regarded by many as one of its highlights. Giacchino has become one of Abrams' closest collaborators, the two men favouring a classically old-fashioned approach to film music along the lines of John Williams and Jerry Goldsmith. It's a partnership that has resulted in several critically acclaimed scores, the most recent being the soaring sci-fi fantasy Super 8 in 2011. In scoring Star Trek, Giacchino is of course contributing to an illustrious heritage, one of the most illustrious in the history of cinema. From Jerry Goldsmith's 1979 masterpiece Star Trek: The Motion Picture to James Horner's career-best Star Trek: The Wrath of Khan in 1982, not to mention the invaluable contributions from Leonard Rosenman and Cliff Eidelman, the history of Trek music is a rich and fascinating one. 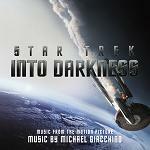 Of course, the challenge with any sequel score is to take the pre-established material and send it in new directions – and Giacchino does this brilliantly with Into Darkness. As heard in the 2009 movie, Giacchino's new Trek theme was enjoyably old-fashioned if a bit short on memorability. But that all changes as we go Into Darkness. Frequently accompanied by an awe-inspiring choir and given a dynamic new recording by Joel Iwataki, the theme gains a sense of newly expansive grandeur and one finally senses that the composer is making his own stamp on an extraordinary sci-fi heritage. Factor in a plethora of compelling musical textures, some entertaining new themes and some blistering action material and the Into Darkness score easily surpasses its predecessor. The main theme opens the score on distant horns in "Logos/Pranking the Natives," lending a delicious sense of anticipation before the music charges into the first of many frenetic action pieces. In recent years, Giacchino has developed a highly recognisable action style with frantic sawing strings accompanied by squealing brass effects and dynamic percussion. One could say its inception began with TV series "Lost" but only in recent years has the composer started to come into his own. "Spock Drops, Kirk Jumps" is even more dramatic and portentous, as the hot-headed latter attempts to save the ever-logical former from boiling to death inside a volcano. When the choir is added it's terrific. "Sub Prime Directive" is where the Main Theme really takes flight for the first time, Giacchino adding further layers of percussion and choir whilst also playing around with the tempo of the theme to lend it a more grandiose air. There's even the briefest interpolation of Alexander Courage's classic TV series fanfare in there – a lovely touch that indicates Giacchino's awareness of Trek's musical history. "London Calling" then takes the score in a new – and very impressive direction – with a beautifully florid Alexandre Desplat-esque piano piece building into a formidable statement of doom. These mood changes make Star Trek: Into Darkness a more enjoyable and varied listening experience than the first score, which was pretty much all bluster from beginning to end. "Meld-merized" then changes tack again, ushering in a note of surprisingly moving tenderness on strings. Towards the end of the track, we get the first taste of the imposing, portentous theme for villain John Harrison – a piece that spells out bad news whilst also carrying a sense of melancholy about it, Giacchino brilliantly capturing the essence of Cumberbatch's baddie. In fact, one of the criticisms of the album release is that Harrison's theme doesn't get a standalone rendition all to itself; it's really very impressive indeed, particularly in an age where film scores don't tend to treat their villains with interesting material. "The Kronos Wartet" sees Giacchino adding his own Klingon theme to the series; he of course follows in Goldsmith's footsteps in this regard. It's a fiercely aggressive piece with a chanting choir, clanging anvils and choppy brass undercurrent, far more hostile and in-your-face than the Klingon themes that have gone before. Harrison's theme again worms its way into the music at the end of the track, an insidious presence matching the character's on-screen ambiguity. "Brigadoom" (another witty track title!) is a low-key piece, playing around with Harrison's theme in the lower registers of the orchestra, even casting it in a sad, moving light. "Ship to Ship" is another blistering piece of action, the orchestra never letting up for 3 gripping minutes; Giacchino once again intelligently weaves in Harrison's theme (showcasing the malleability of the piece) and the Horner-esque pounding ending is most impressive. "Earthbound and Down", as the name suggests, incorporates a sense of free-fall in the brass and strings, the percussion once again hammering home a real degree of tension along with dramatic statements of the Main Theme. Goldsmith's influence is especially notable in this track. "Warp Core Values" is a poignant lament for strings and "Buying the Space Farm" is similarly moving, conjuring a real sense of isolation through some tender piano work. It's an oft-used device but effective enough. Then the score's action highlight "The San Fran Hustle" kicks off, Giacchino really honing a sense of the chase through the relentless orchestral/timpani onslaught. In addition, the resounding, defiant statement of Harrison's theme towards the climax is terrific. It's similar to the ballsy action music in his terrific score for Mission Impossible: Ghost Protocol. The ethereal, choral-infused statement of the Main Theme in "Kirk Enterprises" subsequently carries a new-fangled sense of optimism as the crew prepare to head on to their next adventure; it's a feeling reinforced by another terrific interpolation of Courage's iconic fanfare. With the crew going off into the great unknown, the score concludes with a magnificent full statement of Giacchino's Main Theme, the choir lending a full-blooded sense of majesty to the track, transforming it from a blustrous piece into one truly befitting a space-age adventure. And when Courage's fanfare rounds things off, it's impossible not to smile in recognition. As mentioned before, Joel Iwataki's crisp recording deserves special praise for keeping the vocal and instrumental components perfectly in balance. Star Trek Into Darkness is a highly impressive adventure score and deserves to stand with the better scores in the series – if not necessarily its all-time masterpieces. Giacchino presents a compelling tapestry of ideas and emotions, keeping things fresh and dynamic whilst also playing around with his Main Theme. With this score, it truly feels like the composer has arrived in the franchise and staked his place in the canon, juxtaposing the mystery of space and its often deadly inhabitants with the furious action befitting a modern-day blockbuster. If there are flaws, they largely stem from the album presentation rather than the music itself. It's a shame that the concert piece, "Ode to Harrison" wasn't included as it would have made a wonderful contrast with the adventurous optimism of the Main Theme. 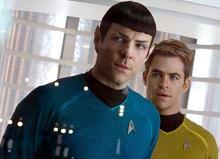 It's also a pity that the tender, haunting theme for Spock doesn't appear, despite featuring in the movie itself. Still, it's refreshing to get a tightly constructed film score release that lasts a mere 50 minutes – many soundtracks nowadays could do with losing a chunk of their running time. What's most impressive about Star Trek Into Darkness is how Giacchino continues the musical legacy of the franchise whilst also continuing to hone his own voice. He's a composer who, at the start of his career, wrote many pastiche scores in the vein of John Williams but now it seems he can evoke the sounds of the great veterans whilst preserving his own musical language. 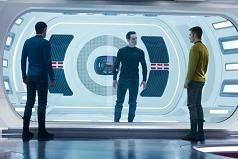 Even if J.J. Abrams doesn't return for the next Trek film, fingers crossed that Giacchino does. For it will be a real treat to explore strange new worlds with this very talented composer. Giacchino's score is available as a CD release and MP3 download at Amazon.com and Amazon.co.uk.